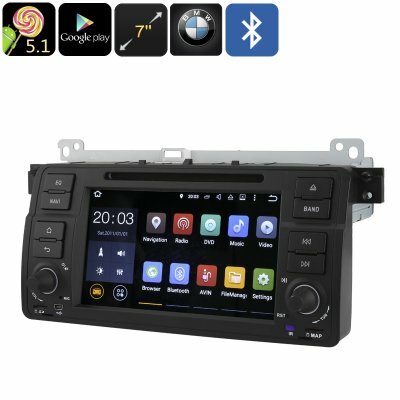 Successfully Added 1 DIN Car DVD Player For BMW 3 Series E46 - GPS, 7 Inch Touch Screen, Android OS, Bluetooth, Google Play, Quad-Core CPU to your Shopping Cart. Bring Android 5.1.1 into your BMW 3 series E46 and enjoy countless hours of fun on the go. Coming with a 7 inch HD touch screen display this 1 DIN car DVD player brings along hours of joy and on-the-road entertainment to all your passengers. Get your DVD collection ready and enjoy countless hours of your favorite movies and series on the road – from now on your road trips will be filled with joy. Featuring a ‘’region free’’ disc player this 1 DIN car DVD player can play any DVD, no matter where in the world it has been purchased. For those of you who do not own any discs anymore, this car DVD player features an Android operating system and Wi-Fi connectivity, allowing you to download and stream the latest media straight on your dashboard. Additionally, this DVD player supports 3G dongles (not included) to provide you with a fast and mobile internet connection no matter where you’re headed. Besides offering the perfect platform to entertain your passengers on a lengthy trip, this 1 DIN car DVD player also functions as a magnificent navigation system that is able to guide you no matter where your upcoming holiday will bring you. With its highly accurate porcelain GPS antenna this car entertainment system is able to locate your vehicle anywhere in the world with 3-meter accuracy. This allows the system to provide you with clear and up to date directions to ensure that you will reach your next destination in the safest and fastest possible manner. Pair your car DVD player with your smartphone through Bluetooth connectivity and gain access to even more functionality. Dial numbers, answer phone calls, or access your mobile music library straight from your dashboard - when paired to your smartphone the possibilities of this 1 DIN DVD player are endless. Featuring a regular AM and FM radio this DVD additionally allows you to enjoy music from regular radio stations no matter where in the world you are located. This 1 DIN car DVD player comes with a 12 months warranty, brought to you by the leader in electronic devices as well as wholesale electronic gadgets..
Arabic: - 1 في مشغل دي في دي السيارة - Chinese Simplified: - 1 在车载 DVD 播放器 - Czech: - 1 v auto DVD přehrávač - Dutch: - 1 in auto DVD-speler - French: - 1 dans le lecteur DVD de voiture - German: - 1 Auto DVD-Player - Hebrew: - 1 בנגן DVD לרכב - Hindi: - कार डीवीडी प्लेयर में 1 - Hungarian: - 1 autós DVD-lejátszó - Italian: - 1 nel lettore DVD dell'automobile - Japanese: - 車の DVD プレイヤーの 1 - Korean: - 1 차 DVD 플레이어에 - Malay: - 1 dalam kereta pemain DVD - Norwegian Bokmål: - 1 i bil DVD-spiller - Romanian: - 1 DIN Car DVD Player - Russian: - 1 DVD-плеер автомобиля - Spanish: - 1 reproductor de DVD de coche - Thai: - 1 ในรถยนต์เครื่องเล่นดีวีดี - Turkish: - 1. araba DVD oynatıcı - Vietnamese: - 1 xe máy DVD.